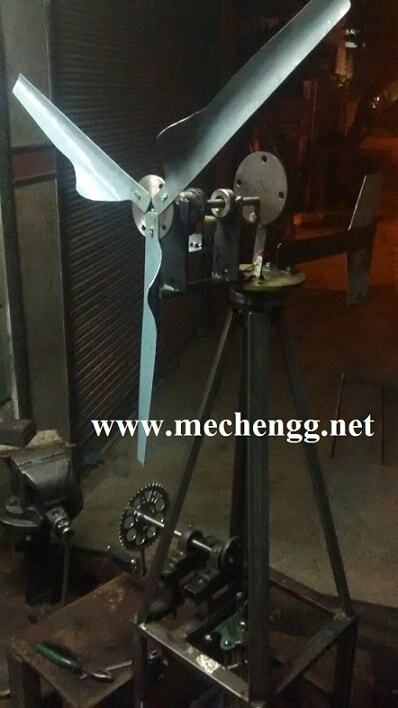 Home » Mechanical Projects concepts » WATER PUMPING SYSTEM AND POWER GENERATION BY USING WIND POWER AND PEDAL POWER. This project is a combination of mechanical engineering and sustainable development in developing countries. The goal has been to build a windmill driven water pump and to design a small-scale irrigation system. The windmill drives a pump that pumps water from a well to a tank for further use in irrigation. Water supplies such as wells and dugouts can often be developed on the open range. However, the availability of power supplies on the open range is often limited, so some alternate form of energy is required to convey water from the source to a point of consumption. Wind energy is an abundant source of renewable energy that can be exploited for pumping water in remote locations, and windmills are one of the oldest methods of harnessing the energy of the wind to pump water . You can save money and help reduce air pollution by using renewable energy sources such as wind power for your home, for drip irrigation or for livestock water wells. Wind energy can be excellent options in remote areas where the costs of extending transmission lines are high. To make a wise decision on renewable energy sources, it helps to understand some basic concepts about renewable fuels, including: How solar and wind energy pumps work. The main components of these pumps. The advantages and disadvantages of wind energy pumps. How to calculate your pumping requirements. It is also important to consider the costs of buying and using a pumping system, which include the initial cost, energy costs and maintenance costs. The project presented in this report will be a combination of mechanical engineering and sustainable development in developing countries. The goal of this project is to build a windmill driven water pump that can pump water from a nearby source to a tank. The purpose is to enable to demonstrate and spread knowledge about wind-powered water pump technique to farmers. As previously mentioned, is interested in building the proposed windmill construction. A windmill would provide good means for showing visitors how wind energy can be used for water harvesting. That is the main reason for building the windmill. The secondary reason is to use it to pump water to a tank for further use in irrigation. And also interested in a solution for an irrigation system connected to the tank. The irrigation system shall be designed, but it shall also be used to demonstrate small-scale irrigation methods to farmers. The keywords for this project are simple and cost-effective, so that it will be possible for local farmers to use the techniques on their own farms. The pumping of water through small wind powered systems has become popular due to its flexibility over other mechanical systems and its advantage of using the spare electricity for other applications In WEWPSs, a wind powered rotor is coupled to a synchronous generator with permanent magnets, which convert the wind energy into electrical power energy. Synchronous generators are most commonly designed for the charging of storage batteries. The asynchronous generators are typically found in large wind turbines. The generator is then coupled to a common induction motor, which drives a centrifugal pump for water pumping. The essential components of WEWPSs are illustrated. The water-pumping windmill is a simple machine that uses mechanical advantage in multiple ways. It’s a direct-drive device that transfers energy via gears, rods, simple valves, and a piston in a cylinder—and uses high torque to move water. The blades of the windmill wheel catch the wind—just like the sails on a sailboat—which turns the wheel (rotor). The wheel is attached to a shaft by long arms. The shaft has small pinion gears at the other end, inside a gearbox. The pinion gears drive larger bull gears, which move pitman arms. The pitman arms push a sliding yoke up and down, above the bull gears (much like a crankshaft, connecting rod, and piston in a standard vehicle engine). The moving yoke lifts and drops the pump rod to do the work down below. The pump rod goes down the tower through a watertight seal at the top of the well’s drop pipe, and to the pump cylinder, the part that moves the water. The cylinder is attached to the bottom of the drop pipe below the water level, and has a simple piston and two check valves. As the piston rises, water moves up the pipe above it. At the same time, water is sucked through a screen and the lower check valve below the piston, into the lower section of the pump cylinder. When the pump rod reverses and begins to descend, the lower check valve closes and the piston check valve opens. This allows water in the cylinder to pass through, and the water that is trapped above the piston to be pushed up out of the cylinder and ultimately to its final delivery height. One might think of the pump as a cup with a trap door in the bottom that opens when the cup falls and shuts when the cup rises. This cycle is constantly repeated as the wind wheel turns to move the pump rod up and down. • Steady winds are most productive.